PocketQube PQ60 Breakout and Prototyping board - ProtoQube! I haven't added a blog post for a while, so I thought I'd put something out there on the PocketQube front. I've posted various updates on the OzQube-1 Twitter and Facebook pages, but I'll try an put a bit more info around things here. Apart from all the PCBs and subsystems I'm making for OzQube-1, I wanted to build something to promote the PocketQube PQ60 form factor, to show that it can be a versatile form factor, not only for satellites. The best way to do this is to make something that people can actually use. So what better way than to create a breakout and prototyping board based on the PQ60 form factor! I call it - "ProtoQube!" The pin pitch is .6mm , so it can be a bit tricky to attach wires to the connector pins. So I've broken out all the individual circuits to a 1.27mm ( 0.05") pitch connector along the edge of the board. 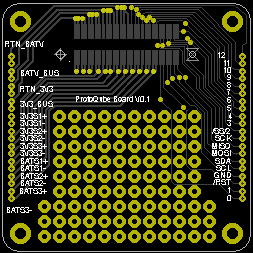 The board can be used with or without a pin header. You could put some female sockets on the top of the board, just like an Arduino. I'm going to be selling these for $25 through Tindie once they arrive, so send me a message or join the waitlist on Tindie if you're interested! They should be here by Christmas if I'm lucky.